Perhaps because of my New Jersey upbringing, I love Italian-American classics like eggplant parmesan and spaghetti and meatballs. Cheese ravioli is another childhood favorite that has followed me into adulthood. Paco and I purchased some over the weekend, and I made a lighter version of pork ragu to serve with it. The original version of the ragu is delicious, but I thought that a sauce with a higher ratio of tomatoes to meat would be great over a pasta as hearty as ravioli. The basil added a freshness to the sauce, while the dried mushrooms gave the broth an earthiness. This recipe makes quite a bit of sauce! It makes enough to serve six, but it will freeze well. It’s hard to make something that needs to simmer for so long in an amount appropriate for two people. Even if one of them really really likes pork. 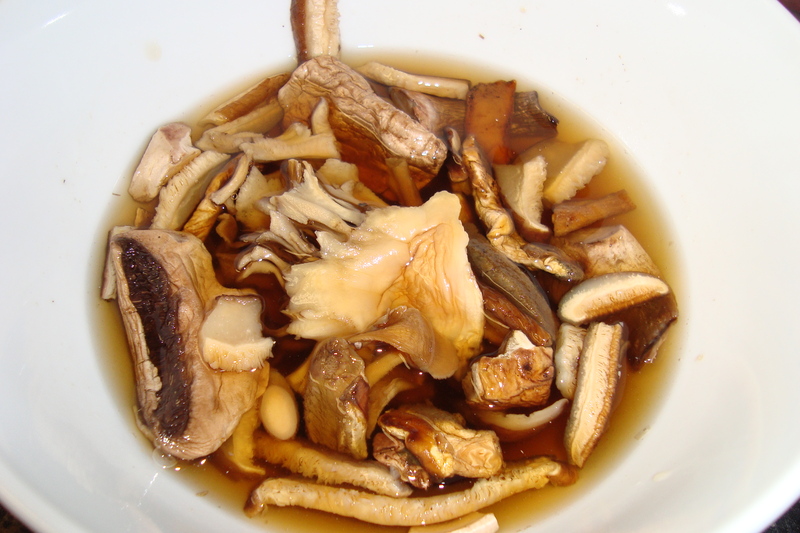 Soak the dried mushrooms in a cup of warm water. Coat the bottom of a medium-sized Dutch oven with olive oil. Heat over medium heat. Add the celery, carrots, onion, and garlic, and stir to coat with oil. Season with salt. Let the vegetables brown at the bottom of the pan, then stir and repeat 2-3 times. While the vegetables brown, gently remove the dried mushrooms from the soaking liquid, and chop finely. Do not discard the soaking liquid. Add the tomato paste to the pot and stir to coat the vegetables in tomato paste. 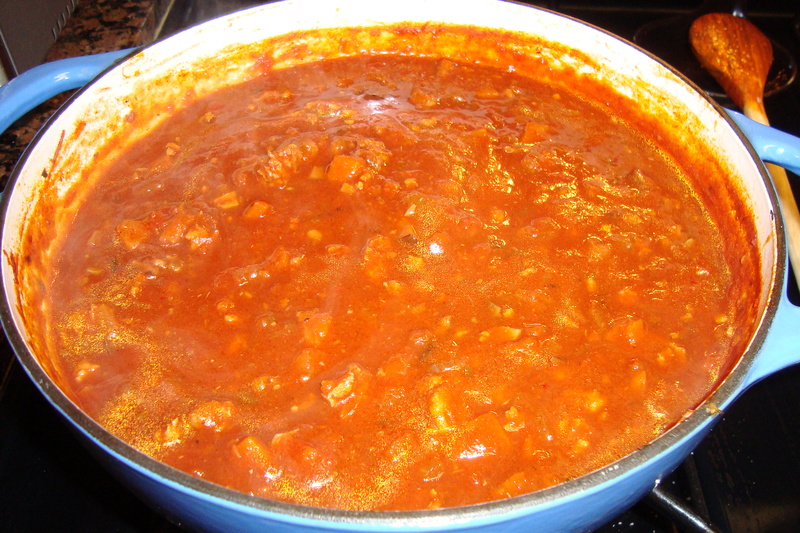 Allow the tomato paste to brown for 2-3 minutes, stirring frequently to prevent it from burning. Add the sausage and ground pork. Break up the meat with a wooden spoon, and brown it for 10 minutes or so. Add the liquid that you soaked the mushrooms in, but try not to include any sediment that has sunk to the bottom of the bowl. Add the chopped mushrooms and crushed tomatoes. Fill the empty can of tomatoes halfway with water, then pour the tomato water into the pot. Add the oregano, paprika, and red pepper flakes. Stir, taste, and season. Cover and simmer for two hours. Every 15 minutes, stir, taste, season, and add more water if necessary. 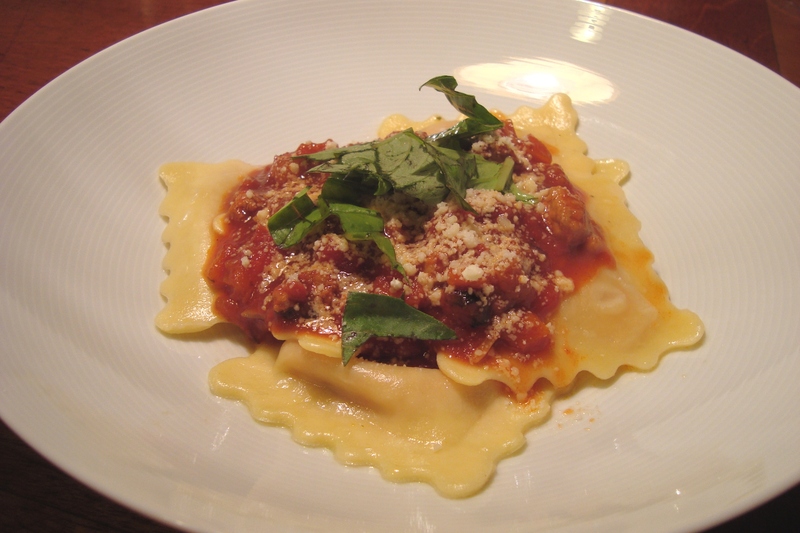 When the sauce is ready, serve over pasta (ravioli, in my case) with fresh basil and parmesan. The secret to this potato salad is the potatoes roasted in bacon fat (obs). 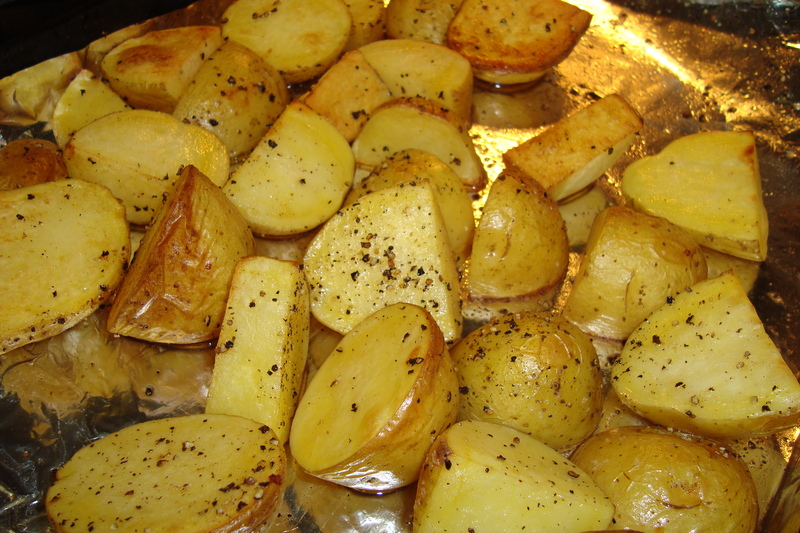 They are crispy and golden on the outside, and the tangy apple cider vinaigrette cuts the fattiness of the potatoes. 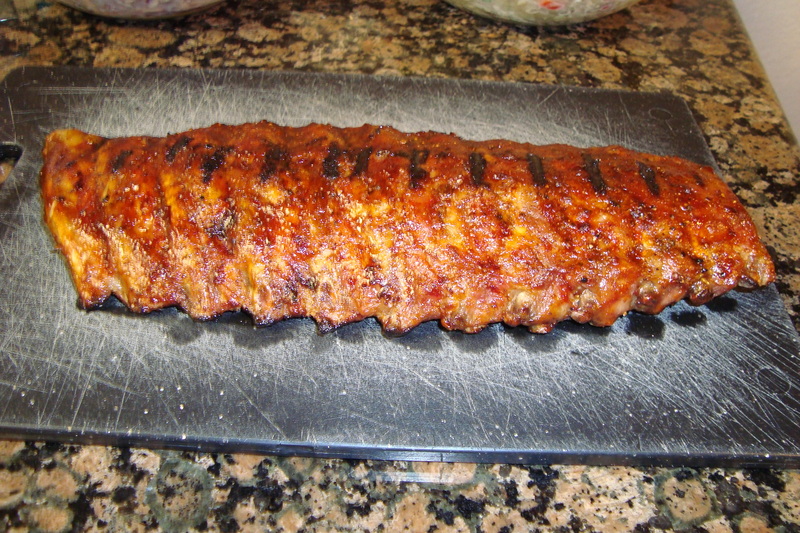 Make this for your next barbeque, it will be a hit! First, brown the bacon over medium heat in a skillet. When the bacon is crisp, remove it from the skillet with a slotted spatula and drain on paper towels, but save the rendered fat. Spray a baking pan with non-stick spray, then arrange the potatoes in a single layer. From the skillet you used to cook the bacon, take 1-2 T of bacon fat and toss the potatoes in it. Season with salt and pepper. Bake for 30-35 minutes or until golden brown. While the potatoes are roasting, make the vinaigrette. Combine all ingredients in a bowl and whisk with a fork. 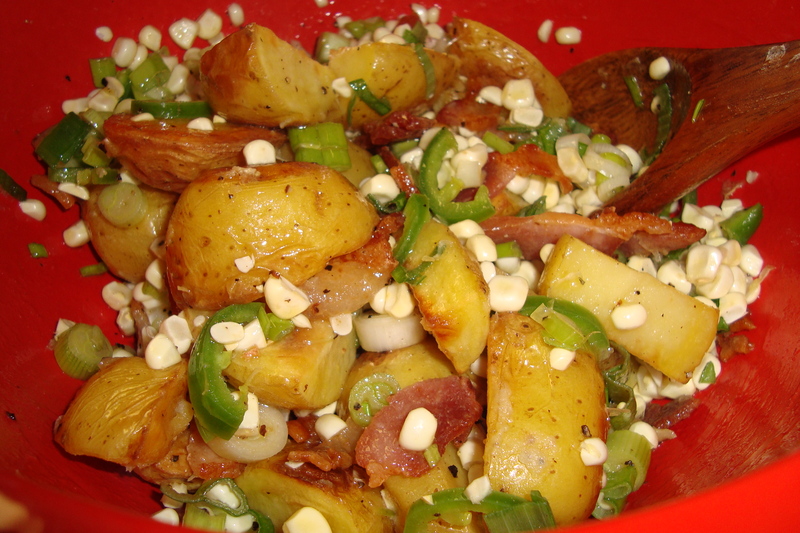 When the potatoes are cooked, combine them in a large bowl with the green onions, corn, bacon, and jalapeño. Add the vinaigrette and stir. Taste the salad and make sure it is seasoned appropriately; I had to add a little bit more apple cider vinegar at this point. I usually make turkey pozole, but I wanted to make a pork-based version. I used spare ribs because I wanted a cut of meat that braises well, but I needed something with a bone to add to the flavor of the broth. 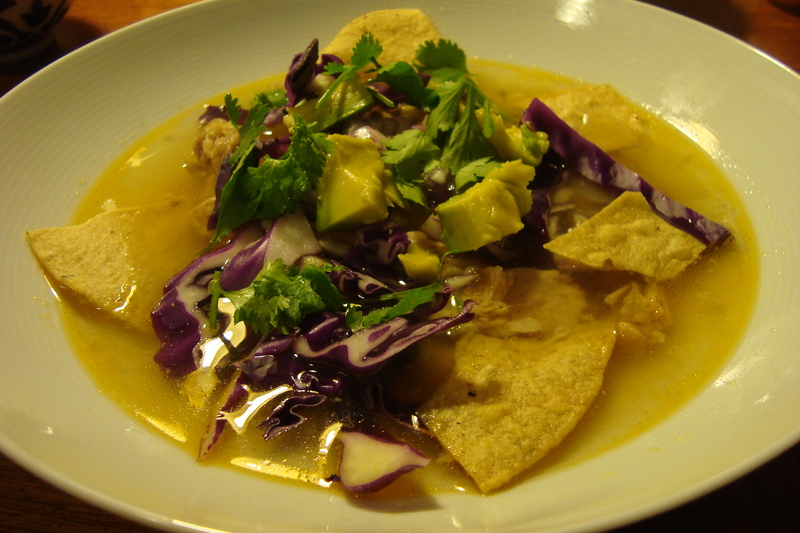 This was even easier to make than turkey pozole, because you don’t have to brown the spare ribs first! 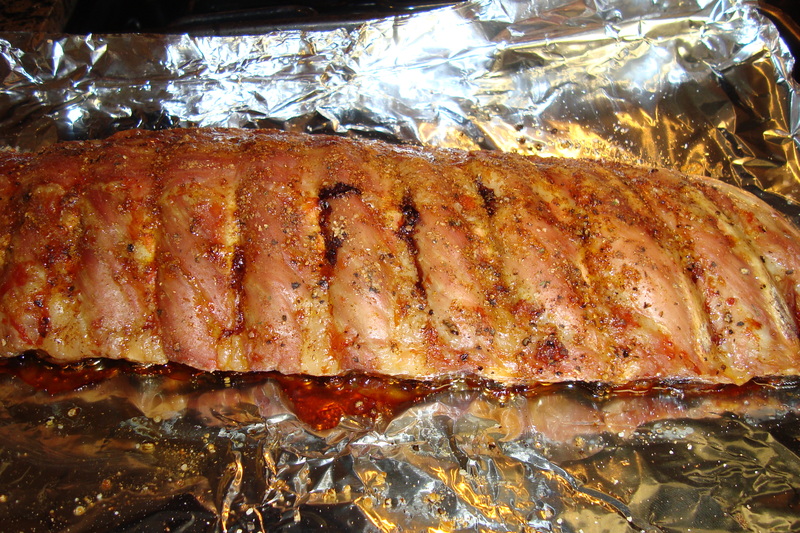 Rinse the spare ribs, then cut into individual ribs. Put them in a large pot, and cover with water by two inches. Add the onion, garlic, chile, and oregano, and season generously with kosher salt. Heat over medium-high heat until the water reaches a boil, then reduce to a simmer. Simmer for 2 hours, or until the meat is tender and can be easily pulled from the bone. 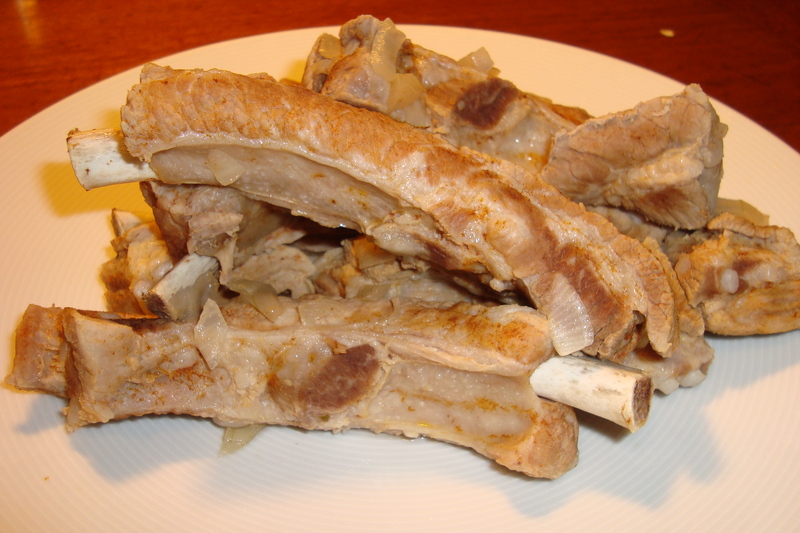 Turn off the heat, and use tongs to remove the ribs from the soup. While the ribs cool, stir the hominy into the soup. 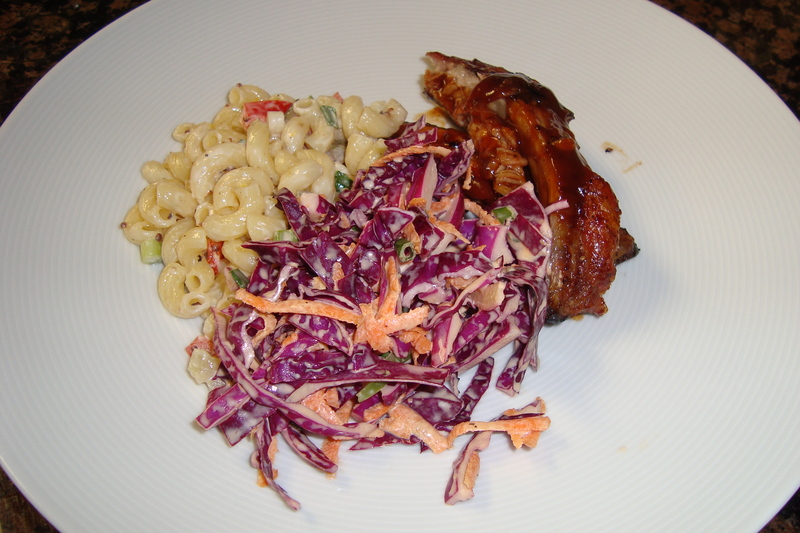 Shred the meat from the ribs and discard the bones. Add the meat to the soup, then stir and warm over medium heat. 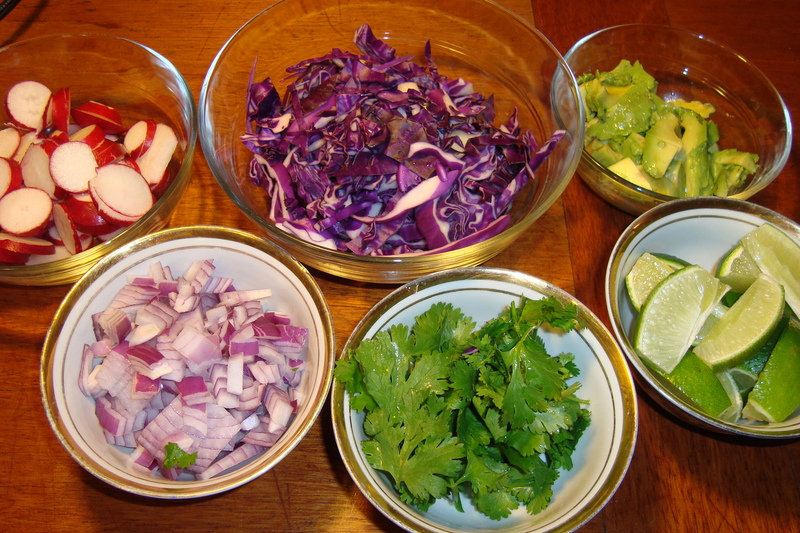 Serve with cabbage, tortilla chips, limes, cilantro, diced onion, and avocado. The secret to juicy pork chops – Brining! Pork chops are one of those things that I always thought were just okay. They aren’t as juicy as a steak, and they aren’t as flavorful as some of their other pork cousins (ribs, pork shoulder, pork belly). The first time I ever saw someone brine a pork chop was years ago in San Francisco. 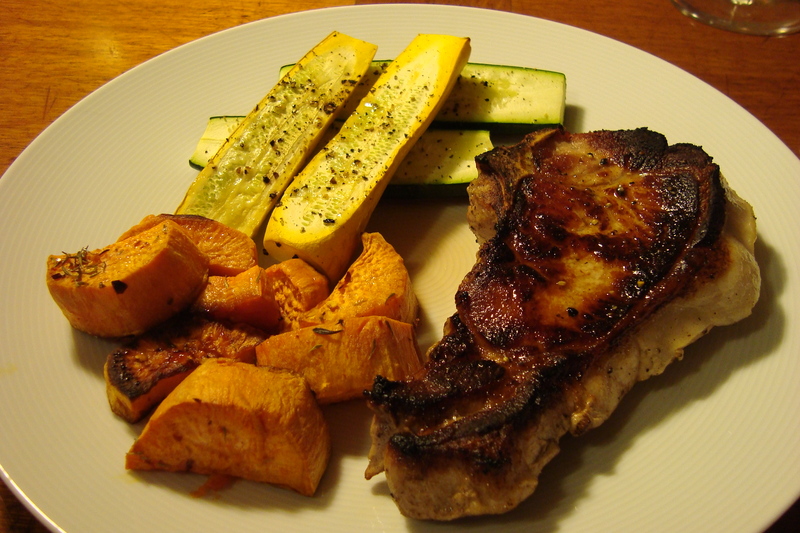 My friend Blake cooked the juiciest pork chop I had ever tasted, and since then, I have always brined my pork chops. You can use brine to infuse flavors into your meat, but I usually just make a plain one for the juice factor. Feel free to experiment with different herbs and spices! Dissolve the salt and sugar in the warm water. Add ice cubes to cool the water, then add the pork chops. Cover and refrigerate for 4 hours. 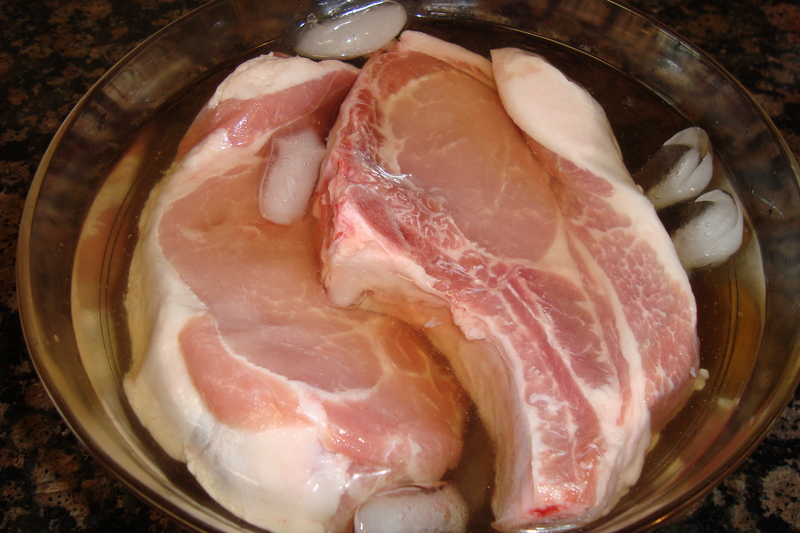 When you are ready to cook your pork chops, remove them from the brine and rinse thoroughly. They will be very salty if you skip this step! Pat dry with paper towels. Season the pork chops with black pepper or any other desired seasoning, then sear over medium-high heat in a skillet with olive oil for 3-4 minutes on each side. We have ours with grainy mustard on the side.